Transport union RMT is officially backing Janine Booth - a Socialist Green Unity Coalition candidate in Hackney, east London - in next month's local government elections. RMT's Scottish region is officially affiliated to the Scottish Socialist Party, of course. But this must be the first time a major union has endorsed anybody against Labour in England for decades. RMT has also come out for John Marek of Forward Wales and independent socialist Peter Law for the Welsh Assembly. This development comes after Unison Labour Link's decision not to fund or work for Labour on May 4. Both moves underline the growing disaffection with Blairism among organised workers. Some groups on the far left - most notably the Socialist Party - are actively demanding union disaffiliation. There are dangers with this as a tactic, especially given the lack of a credible alternative to Labour on the left. Unions leaving the Labour Party could just as easily become depoliticised as radicalised. It's not that I'm against such calls. I am just arguing they should be handled carefully. 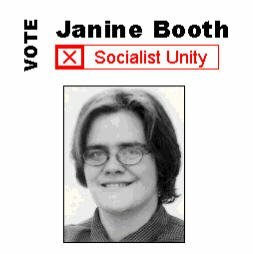 By the way, I can personally endorse Janine, an RMT activist who stood for the Socialist Alliance in the 2001 general election. The ward she is contesting this time round is not too far from where I live, and I intend to help canvass for her at some point. Details of the campaign can be found here. Perhaps significantly, RMT is not backing Respect, the Socialist Workers' Party/George Galloway electoral vehicle, which is likely to win council seats in the heavily Muslim boroughs of Tower Hamlets and Newham.